This continues our Social Media For You series. The first article was for Minimally Invasive Spine Surgeons. Plastic surgery is a unique and gratifying specialization. There are many motivations for seeking plastic surgery. In certain cases, plastic surgery is a medical necessity, and there are other cases where someone seeks plastic surgery to make themselves feel better about their outward appearance. Regardless of the motivation for seeking plastic surgery, it is important for plastic surgeons to have a presence in social media. Social media is a promotional tool, just like your practice's website. In fact, the practice website and social media should be seen as complementary. They need to work harmoniously together to raise the profile of the practice, develop positive beliefs about the surgeon among potential patients and ultimately convince potential patients that this practice is going to the best option for their plastic surgery needs. Facebook and Twitter are the first social media outlets to consider for your practice. But remember what social media actually is-social. That means you need to be interacting with potential patients and your existing patients. You can't simply just broadcast messages out there and expect to book new procedures constantly. Television and radio are more ideally suited to widely broadcast messages, but they are quite expensive to book. In social media, you can promote your practice's attributes, but your target market has to feel the connection to your practice. This is especially important in plastic surgery, which has a significant emotional side to it. You can share knowledge, success stories, and photos to promote your practice, but you also must interact with your Followers and Fans. This is a cost effective promotional tool. 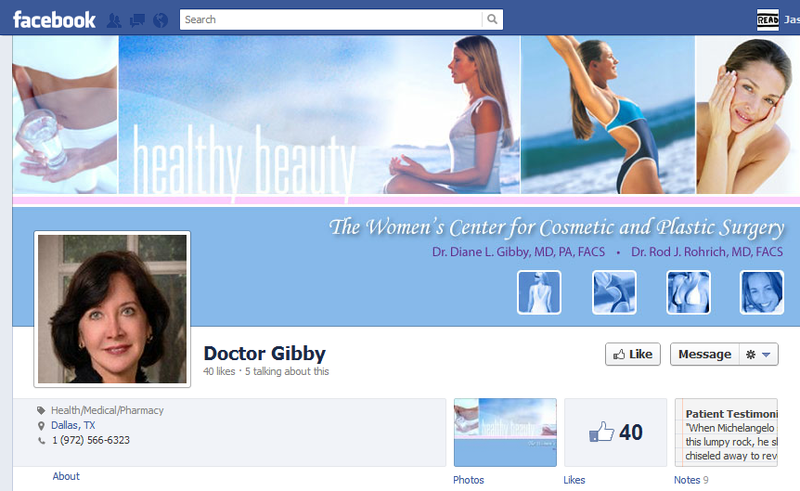 YouTube and Pinterest are relevant for plastic surgeons as well. YouTube is going to be central hub for your video presence, and as a plastic surgeon, video is vital. Plastic surgery is a very visual discipline, since a plastic surgery procedure affects someone's outward appearance. YouTube videos are meant to work in conjunction with other digital media properties, and they can elevate your practice's profile. Pinterest is the hot new social tool, and Pinterest is all about pictures. Since plastic surgery is very visual, Pinterest is a must in the social media mix, which might not be the case for other types of medical practitioners. With YouTube and Pinterest, the focus should be on quality, not quantity. Sure, there needs to be some degree of quantity, but quality matters most. Pictures and the images that comprise video are the visual representations of your visually oriented business. So you really need to put your best foot forward in this area. You can also use social media in conjunction with a strategy to rank well in Google. In fact, this is recommended. Search engine optimization makes it easier for your website to get found, as well as your various social media pages. Between the website, search engines and social media, you're developing a presence online. Certain practices can also choose to bolster this presence by placing ads with Google Adwords, one of the strongest ad platforms online. When you advertise on AdWords, you can that your audience is seeking your product category, and is more apt to view your advertisement if it is well written. This is easier said than done and takes practice. If you’re not active in social media, chances are that your competition is and they are taking your potential business. The bottom line is that social media is good for your bottom line. To navigate the waters of social media and digital marketing more effectively, contact David Mitchel of ViralMarketing.Biz today. He can help you help your practice's bottom line.